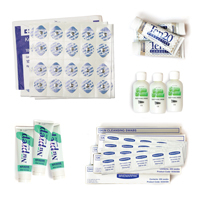 Buy disposable electrodes, electrode paste, adhesives, myograph wire, and other disposable consumable items. Biopotential Accessory Kits provide consumable products for biopotential and nerve recordings on human subjects. Trigno Mini Sensor Adhesive (2-Slot, 80 pack) consists of specifically designed adhesive interfaces to attach Trigno Mini Sensors to the human skin. Full set of replacement O-Ring Kits for the Panlab Single Chamber Organ Bath and Panlab​ Langendorff Apparatus. An electrode paste that is specially formulated with 0.5% saline in a neutral lotion/cream style base, making it ideal for measuring human skin conductance with any Ag-AgCl reusable electrodes in electrodermal activity studies. Syringe (5 cc) and Blunt needle (16 gauge) pack of 100 for use with the Electro-cap System.